Todays inspirational post uses Karleigh Birthday Sweets. Again, I forgot to list the colours of the polychromo pencils used - sorry..
Mat and layered her on more circles from papers in my stash. Added as ribbon and bow from my stash. Please pop over to Karleigh Sue challenge blog and share your projects. 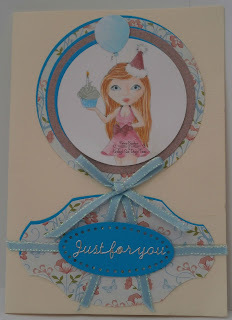 Such a pretty card Theresa, the image is coloured beautifully! Thanks for joining our very first challenge at the Pencil Case and I hope you will join many more!